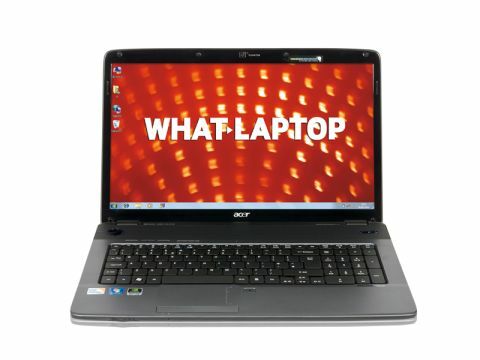 The Acer Aspire 7736G-663G25Mn is a large, entry-level multimedia laptop that offers good everyday performance. Usability is also excellent and, while it isn't the lightest machine, it also impresses on portability – offering 307 minutes of battery life. The large 17.3-inch screen dominates proceedings. It isn't as sharp as the PC Nextday's LogiQ 89-2411, but colour reproduction is great, making it suited to watching films and editing photos. A shiny Super- TFT screen coating is included, but it suppresses reflections reasonably well. Build quality is solid and, even though you're unlikely to carry this laptop around much, its durability is impressive. The screen lid features an attractive shiny-blue design, while the mottled-grey palmrest helps the laptop to stand out from the crowd. The keyboard is firmly mounted into the chassis and there's very little flex evident. Acer's unique keyboard design, whereby the keys stand up independently from the chassis, is in evidence. While it provides a very fluid typing experience, it is likely that over time dust and dirt will collect under the keys. It may also eventually hinder the typing action, so regular and thorough cleaning will be necessary. The large, multi-gesture touchpad makes navigating through and around the operating system and your applications very intuitive. The Acer boasts good performance, courtesy of an Intel Core 2 Duo processor and 4096MB of memory. You'll have no issues concurrently running office applications, such as word processors and even more resource-intensive applications. Despite being able to run programs such as photo editing software, an integrated graphics card ensures that this laptop isn't suited to resource-intensive 3D work and you'd do better to check out the MSI or Samsung if this is a priority for you. The 320GB hard drive is fairly standard, and the Tri-Format DVD DL optical drive makes reading and writing DVDs simple. Networking is suitably top-notch, with 802.11n Wi-Fi and Gigabit Ethernet both present. The inclusion of four USB ports is the most generous here, and there's also VGA and HDMI-out ports for hooking up to analogue and digital external monitors. A modem rounds out the specifications. We're huge fans of the Acer Aspire 7736G-663G25Mn and, while it isn't the most portable of machines (though its battery life of 307 minutes still impresses), it's a fantastic desktop replacement system.